A 66-year-old man was arrested Monday for stealing coffins among other items from a funeral parlor in Ramon town in the province of Isabela. According to a report aired Wednesday on ABS-CBN's morning program Umagang Kay Ganda (UKG), police recovered 6 coffins, 4 carpets, 3 wooden chairs, 2 burner stoves, a metal coffin stand, and a wooden coffin stand in the house of Severino Alegado. The municipality's police head, Chief Insp. Juancho Alloba, said it's the first time that caskets were stolen. Alegado, a carpenter, claimed that he owns the building being rented by the funeral home. 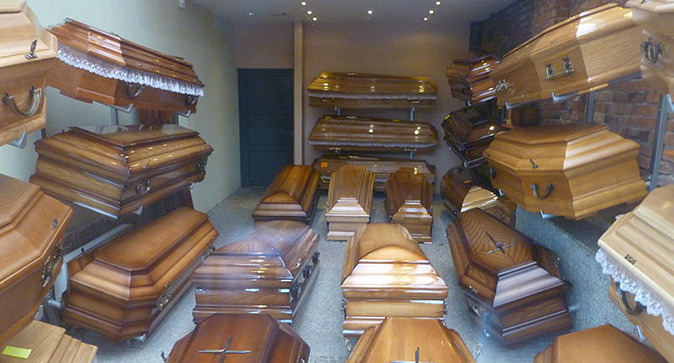 He admitted to have taken the coffins because the business establishment did not pay rent. However, the owner of the funeral parlor denied the allegation. Efren Cadiz reportedly said Alegado is not the owner of the property but a certain Mr. Cabuyadao. The old man, who got arrested for stealing coffins, failed to show proof of ownership of the building being occupied by the funeral parlor, the report said.